This set of Biochemistry Interview Questions and Answers focuses on “Ionization of Water, Weak acids and Weak Bases”. 1. What is the concentration of OH– in a solution with a H+ concentration of 1.3×10-4 M? = 7.7 × 10-11 M.
3. Which of the following acids has the lowest pKa value? Explanation: The stronger the acid, the lower its pKa. Sulphuric acid is the strongest acid of all the other acids mentioned, so its pKa is the least. 4. Which of the following bases has the highest pKa value? Explanation: The stronger the base, the higher its pKa. NaOH is the strongest base of all the other bases mentioned, so its pKa is the highest. 5. The degree of ionization does not depend on? Explanation: Degree of ionization is independent of current. It depends only on temperature, nature of solvent and concentration. Explanation: CH3 COONa is a salt of weak acid and strong base. 7. K1 and K2 for oxalic acid are 6.5×10-2and 6.1×10-5respectively. What will be the [OH–] in a 0.01M solution of sodium oxalate? Ka = 10-14/-log (10.83) = 6.75 × 10-4. Explanation: Detergent is a salt of weak acid and strong base. 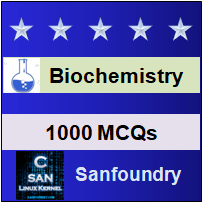 To practice all areas of Biochemistry for Interviews, here is complete set of 1000+ Multiple Choice Questions and Answers.